Iliriana Sulkuqi ( Albania- USA) | Galaktika Poetike "ATUNIS"
Iliriana Sulkuqi (Fejzullai) was born in the city of Elbasan ( Albania) in 1951. Iliriana Sulkuqi studied at the Armed Forces Academy. Sulkuqi also completed studies in linguistics, literature, and philosophy. Upon graduating until 1995 Iliriana Sulkuqi was an officer at the Armed Forces Academy and is a lieutenant colonel. While an officer Sulkuqi was also a journalist for the military press: a time in which Sulkuqi gave her contribution as an editor at the Armed Forces Publishing House. Her latest engagement as a journalist was for “Drita” (The Light) newspaper, a publication of the Albanian Writers Union. 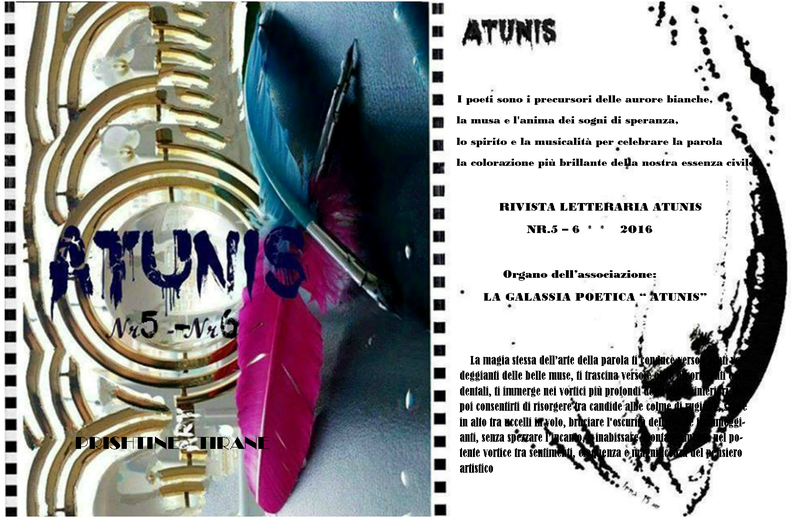 Currently, Iliriana Sulkuqi overseas the publication of Pelegrin, a literary magazine. Since 2004 Iliriana Sulkuqi resides in New York. Iliriana Sulkuqi began to write at an early age. Sulkuqi has received numerous national and international awards. 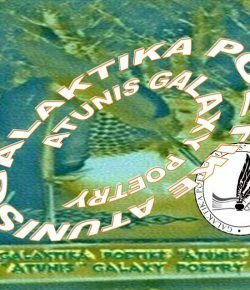 Her poems have appeared translated in: Italian, Greek, Macedonian, Bulgarian, Rumanian, and English, and have been included in several anthologies published in Albania and elsewhere. An entrance about Iliriana Sulkuqi could be found in the Albanian Encyclopedia of Journalists and “Leksikoni i shkrimtareve Shqiptare 1501-2001” (The Leksikon of Albanian Writers 1501-2001) authored by Hasan Hasani. Iliriana Sulkuqi is the author of several books of poetry. Currently she is in the process of publishing two more books “My homes in Kosova”, and “Po plaaas…!” ( I’m fed up), a dedication to her hometown Elbasan: a collection of essays, poetry, short stories, interviews and correspondence. “Kësulkuqja” (Little Red Riding Hood) a children’s magazine, was Sulkuqi’s idea who also contributed to its publication. 3000 copies of the magazine were donated to children in Kosova and Macedonia. 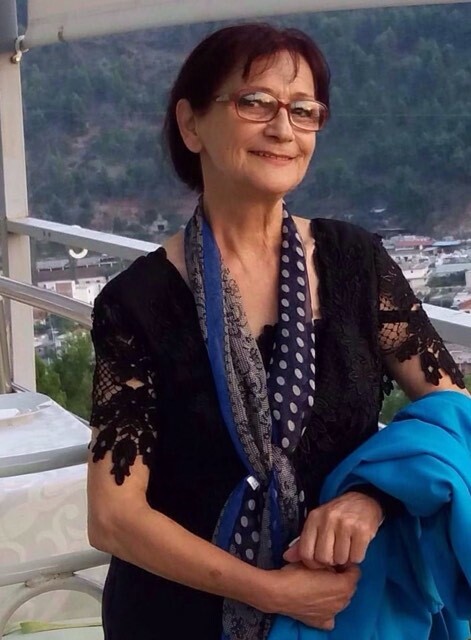 Further, Iliriana Sulkuqi was the contributor and initiator of an anthology of works by Albanian writers in Exile titled “Perëndim i malluar” (Longing for the sunset), edited by Dhori Thanas, published by “Arberia” Publishing House. Since 1974 Iliriana is a member of the Albanian Writers Union; since September 30, 2003 a member of the International Federation of Journalists; member of the Albanian- American Academy of Arts and Science (January 5, 2006); member of the Albanian Writers Club Drita. (in the process of publication, are small formats books of remembrance for Martin Camaj, Qazim Shemaj, Bajazit Cahani and Vasil Dede). A study about Iliriana Sulkuqi’s poetry called “POETRY AS ANOTHER ‘DEBT’ FOR THE TIME BEING” was edited and published by Prof. Dr. Fatmir Terziu (Lulu, USA 2016) and (Milosao, 2017). Third prize for the bilingual poetry volume “My Ofelia was killed! Oiii…Oiii…!” awarded by the Ministry of Arts, Culture and Sports and the Writers Union on the occasion of Albanian Poetry Day “Lulet e Veres” (Summer Flowers), May 2001. 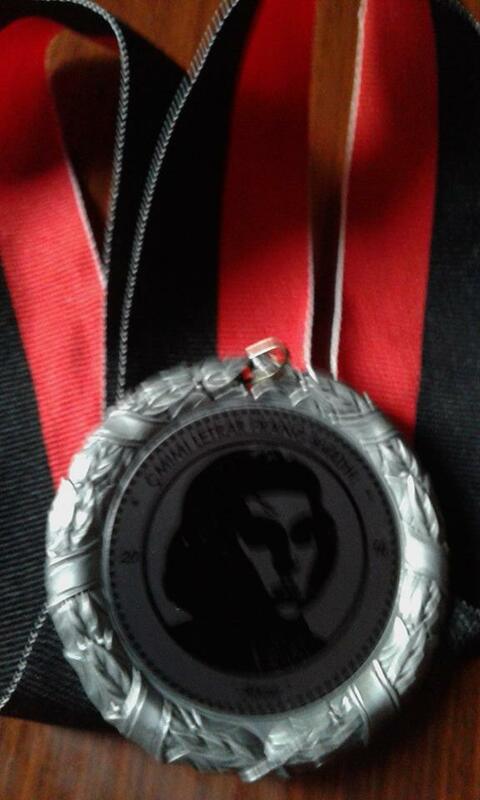 First prize for the best poetry during the gathering Pellumbat e Bashtoves (Bashtova’s Doves), awarded by the Durres Branch of the Albanian Writers Union, 4 Tetor 2005. “Migjeni” Award (2007) by “Kuvendi”, a magazine published in Michigan, U.S.A.
– Iliriana Sulkuqi, was awarded the “Distinguished City Artist” award on 24 September 2009 at the “Poeteka 2009” event by the City of Elbasan “For a remarkable and qualitative contribution to creation and promotion of artistic values in the field of poetry, and remaining a worthy citizen of the City of Elbasan”. – On 13 March 2018 the City of Elbasan awarded her with the “Gratitude of the City” award for being “Elbasan’s blessed daughter for her Brilliant Poetry and for honouring her birthplace”. – Albanian Art and Culture Center awarded her the title “PRINCIPLE OF ALBANIAN ART AND CULTURE” “For her extraordinary contribution as a poet. As a devoted promoter of Albanian culture. By delivering pure poetic speech and clear artistic and human concepts to elevate to the highest peaks, in every corner of the world, the identity of Albanian art and literature”. – Iliriana Sulkuqi was proclaimed “AMBASSADOR OF PEACE” by the World Peace Federation (October 2011). – Iliriana Sulkuqi is honored with the title “MOTHER THERESA,” for displaying “Reflection of Kindness, Peace, Love for a Special Contribution to Art, Culture and Humanism”, Skopje, 2016. Iliriana Sulkuqi’s life and work is depicted in a documentary film (in Albanian and English) which was a collaborative work between Angjelina Xhara, Ilia Terpini, Kolec Traboini, and Margarita Xhepa. Dritëro Agolli- poet, writer, academian; Xhevahir Spahiu-poet, academian; Moikom Zeqo-poet, scholar; Odhise Grillo-children’s books writer; Skënder Hasko-children’s book writer; Anton Çefa-poet, writer, journalist, critic(USA); Faruk Myrtaj-writer, literary translator; Klara Kodra-poet, scholar, literary translator; Pëllumb Kulla – writer ( Awarded with Mjeshter i Madh title)(USA);Fatmir Terziu-writer, journalist, critic, literary translator(UK); Nase Jani-poet, writer, publisher, Chair of the Writer’s Club “Drita” (The Light) in Greece; Sokol Jakova – writer, critic; Dalip Greca- editor of Illyria, New York; Kristo Tumanidhis -poet, scholar, literary translator (Greece); Vasil Qesari- journalist, writer (France);Abas Veizi-writer, poet, editor, literary translator, publisher; Visar Zhiti-poet, writer; Demir Gjergji-poet, writer, journalist; Kolec Traboini-poet, critic; Vangjea Mihaj Steryu-poet, writer (Skopje, Macedonia), Head of the Arumenian Writers Union; Puntorie Ziba-poet, writer (Skopje, Macedonia);Fatime Kulli-poet, writer, journalist;Aleko Likaj-writer, journalist (France); Valdete Antoni-poet, journalist; Miradije Maliqi- writer (Switzerland); Nehat S. Hoxha-writer, critic, literary translator (Prishtina, Kosova); Esat Teliti – film producer; Rami Kamberi-writer, critic (Macedonia);Rrezarta Reci – journalist, publicist; Tinka Kurti – Aritste e Popullit, actress; Margarita Xhepa – Artiste e Popullit, actress; Dr. Anna Kohen- President of the Albanian American Women Organization, etc. With candles adorn my body!